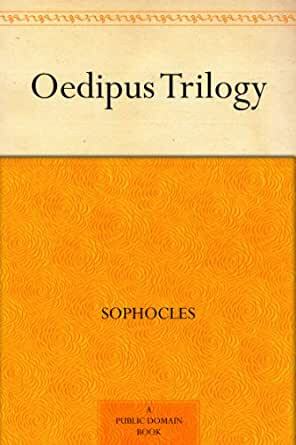 Oedipus Trilogy - Kindle edition by Sophocles, Francis Storr. Literature & Fiction Kindle eBooks @ Amazon.com. 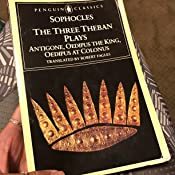 This is not really a translation but, as Spender calls it, a "version" of Sophocles's three Theban plays. These disparate plays, composed over 40 years, are rendered here as if a trilogy. One wonders to what purpose: ostensibly so that they may be performed in a single evening. Such conflation results in inevitable contradictions, which Spender seeks to exploit rather than suppress. But do necessary cuts and transpositions revive the Theban story? If each play suffers, Sophoclean themes and symbols are perhaps highlighted: humans as measurers and measured; blindness and sight; family versus city. The answer finally lies in the poetry. Written to be spoken, Spender's dialogue has vigor but his odes soften metaphors drastically, prettifying Sophocles. Stephen Scully, Classical Studies Dept., Boston Univ. One needn’t be educated in the Greek classics to know that somewhere in this trilogy there is a man who gets intimate with his mom. However, the common conception of Oedipus —as in the Oedipal Complex—probably has more to do with Freud and Freudian psychoanalysis than it does with this story. The three plays of this trilogy are “Oedipus the King” [a.k.a. 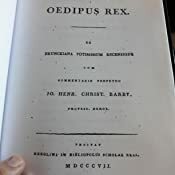 “Oedipus Rex” or “Oedipus Tyrannus”], “Oedipus at Colonus,” and “Antigone” [pronounced “an-tig-o-nee” rather than “anti-gone.”] Of the three plays, the first is the most well-known. In “Oedipus the King,” the titular character is facing a crisis in his kingdom. When the oracles are consulted about how the calamity might be brought to an end, Oedipus is told that he must banish the killer of his predecessor, i.e. the previous king of Thebes. Oedipus consults his own oracle to find out who the ne’er-do-well is who murdered the last king, and the fortune-teller tells Oedipus that he’ll never say who committed the killing —but acknowledges that he does know who it was. Oedipus mocks and threatens the oracle until the fortune-teller gets fed up and tells the king that it was he, Oedipus, who killed his predecessor. Oedipus doesn’t believe it at first, thinking it’s an attempt to facilitate a coup. Far ickier than the accusation of murder is the fact that —if true— it means that Oedipus has been getting busy with his own mother and has even sired children with her. Oedipus calls for an investigation. When a peasant who saw everything is called to testify, his story strikes Oedipus as disturbingly familiar. It turns out that Oedipus’s blood father (the previous king) had been told by his own oracle that his son would kill him and steal his wife, and so he had baby Oedipus sent away to die. Oedipus (who had been rescued from being staked up on a mountain) was coming through Thebes, not knowing it was his homeland, when he had a skirmish on the road with the man that he didn’t realize was both the king and his father. Later, Oedipus marries the queen (apparently there were no busts or portrait paintings of the last king anywhere) and becomes the king without knowing that the man he’d killed in self-defense was the last king / his father. When the truth revealed, everything goes south. The queen kills herself, and Oedipus’s response is almost as severe. Oedipus gouges out his own eyes and goes into exile. 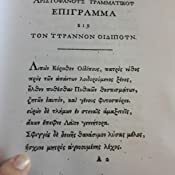 Antigone, one of Oedipus’s daughters, says she will be the ex-king’s guide, and because the old man is blind and not familiar with where he’s going, he doesn’t have much choice but to accept. “Antigone” takes place after the death of Oedipus. The dutiful Antigone is now back in Thebes. When her brother Polyneices is killed and Creon orders that the prince not be buried, Antigone refuses to accept the decree. She steals the body and gives it a proper burial. Antigone was engaged to marry Creon’s son, Haemon, but Creon decrees that the woman will be imprisoned in a cave for disobedience of the king’s order. Haemon asks his father to be reasonable, but Creon will have none of it. Eventually, the words of an oracle convince Creon to change his mind, but he finds himself too late. Like Oedipus, various ruin then befalls Creon. While the details of the story may strain credulity in places, these works are powerful morality tales. The recurring theme is that one can’t make an end-run around fate by way of vice and neither can one otherwise manhandle events to achieve a desirable outcome. Oedipus’s father sends his son to be killed, but the outcome remains the same. Creon can’t plant Oedipus’s corpse where he pleases and neither can he deny a man proper burial. It’s almost a karmic tale. Perhaps, the path to pleasing the gods is through virtue, and not through finagling one’s way to compliance with forecasts. I find it fascinating how crucial a role is played by oracles throughout the three plays—and what that says about human nature. The fortune-tellers are always right and are always heeded. In a sense, this story tells one about humanity’s fear of uncertainty, what people are willing to do to allay that fear, and how the world is ultimately too complex for those attempts to work out. The law of unintended consequences remains ever present. I enjoyed these plays. They are brief, stirring, readable, and thought-provoking. I would recommend them for any reader—particularly those interested in the classics. 5.0 out of 5 starsOne soul is enough, I know, to pay the debt for thousands, if one will go to the gods in all good faith. There’s a pattern with many of these Greek tragedies. Through the sad tales of cursed families, they illustrate the evolution of Western civilization. Fifth-century Athens was a light in the dark, a young democracy, and the Athenians used tragedy as a tool to preserve history, learn from it, and document their growth. With The Oresteia, we saw Aeschylus tackle the ideas of law and respect for the state, and Sophocles continues along those lines, but places the focus on another great philosophical problem–free will vs. fate. Though heady, the plays also had an entertainment value. The Spring festival celebrating Dionysus provided an opportunity for playwrights such as Sophocles to compete and put on a performance for thousands of spectators. Tragedies usually ran in the morning and the more lighthearted comedies toward the end of the day. Being tragedies, lighthearted these three Theban plays are not. They adhere to the Greek tradition of dramatizing the lives of a cursed family, but instead of the House of Atreus, we gain a jagged view of humanity’s affliction through the House of Oedipus. Next comes Oedipus the King, the shining star of the three plays–the painting within the frame. Each piece has its own beauty, but we move back in time to that dreadful moment of discovery. It’s through Oedipus’ actions that we see an evolution in Greek theater. The plot builds perfectly according to Aristotle’s Poetics and is the cornerstone of many a modern story. Oedipus represents the everyman, marching forward, thinking destiny is within his control, only to discover that he is a mere puppet to fate. A plague has struck Thebes and the only solution is to bring the killer of Thebes’ last king, Laius, to justice. Through plot twists and turns, Oedipus dedicates himself to finding the killer, only to discover that he is the killer, and that he has fulfilled a prophecy which he has tried to avoid all of his life. The truth is too much. His wife and mother, Jocasta, kills herself, and Oedipus gouges out his eyes, his one act of defiant free will. Finally, we are presented with Oedipus at Colonus. Many years have passed and Oedipus has become a wanderer, guided by the loyal Antigone. He finds himself in the town of Colonus, just outside of Athens. The oracular prophecy makes its next move: Oedipus has arrived in the place where he must be buried. This play is an ode to Athens, and by being buried just outside the city, it will be protected for all time. Thus ends the Theban trilogy. Similar to my Aeschylus readings, I picked up the Robert Fagles translation. Sophocles’ writing flows easier and is less dense than that of Aeschylus, so if you had a tough time with The Oresteia, you may find Sophocles to be more in your wheelhouse. From Freud to soap operas, you’ll certainly begin to understand the many references to this bit of dramatic history. If you are already familiar with the Oedipus Trilogy, this is a fantastic free digital edition. 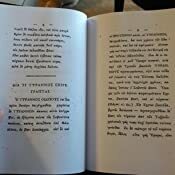 The formatting is easy to read, the text reads easily. My chief complaint with this copy is that there is no navigable table of contents to easily move from one play to the next. If you are completely new to the Oedipus series, do yourself a favor and read it out loud as you are reading it. It may sound silly, but plays are meant to be heard out loud and not read silently. Anyone having a hard time understanding the language will be greatly aided by the rhythms and sounds of the spoken word. Classical reading. Required reading for most high school/college literature classes.